The cryptocurrency industry has always been susceptible to a high amount of volatility, and recent global changes have been some of the most significant. Due to an industry-wide hardware deficit, many market participants, especially mining hardware manufacturers, have to adjust their operations, procurements, terms, and prices of ASIC miners and their delivery. 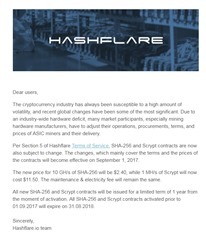 Per Section 5 of Hashflare Terms of Service, SHA-256 and Scrypt contracts are now also subject to change. 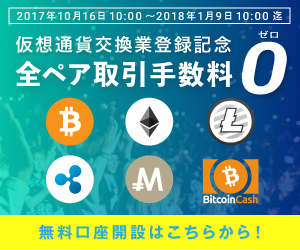 The changes, which mainly cover the terms and the prices of the contracts will become effective on September 1, 2017. The new price for 10 GH/s of SHA-256 will be $2.40, while 1 MH/s of Scrypt will now cost $11.50. The maintenance & electricity fee will remain the same. 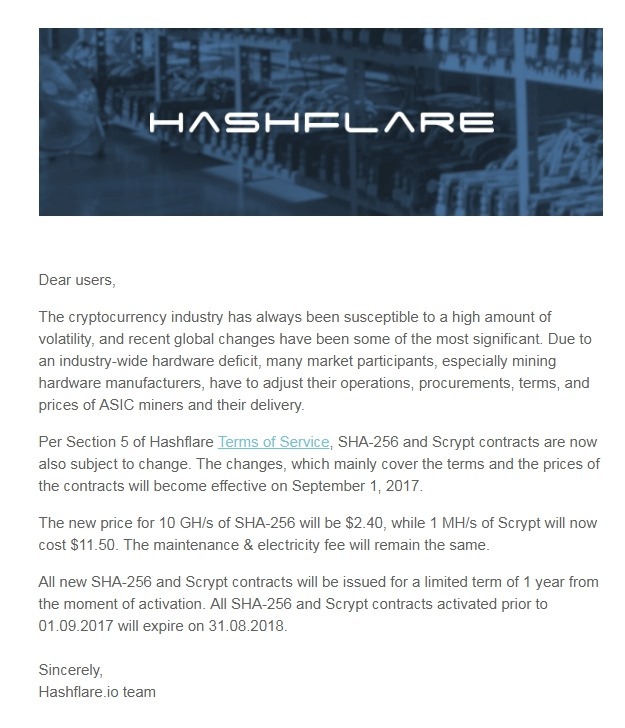 All new SHA-256 and Scrypt contracts will be issued for a limited term of 1 year from the moment of activation. All SHA-256 and Scrypt contracts activated prior to 01.09.2017 will expire on 31.08.2018.